Keep the Alonso comments coming guys, good stuff so far. McLaren are in a similar position to Red Bull last year. Red Bull pretty much got it together by Melbourne, I think McLaren will. Yesterday Alonso said the car is "extreme, agressive & innovative"
Ron Dennis & Eric Boullier said it was "Compact" hence the electrical issues. What exactly is different on the McLaren compared to the others, and what does the Compact part mean ? @Red_ZA: Good question. A compact rear to the car says a lot of things about it. In this case, McLaren has moved a few parts that cluttered the rear of the MP4-29 to the front of the new car's sidepods. This means that the released heat is now expelled via a narrow bottle-shaped rear end, and through a small outlet located above the exhaust. This also seems to indicate that Honda has come up with clever cooling solutions on their power unit. The drawback of a compact and innovative design is you are more likely to suffer teething problems early on. But once you get those nailed, the theory is you should be better placed as you've got a more efficiently-working package. The rear of this year's car is very Red Bull-esque in design and that's hardly a bad thing. Alonso's gamble is no bigger than what Lewis did with Mercedes. He is taking a chance, and I'd say its long overdue. No doubt Alonso deserves another championship!! When and with which team he achieves that is The Question!! @Red_ZA - just look at the rear of the car, this is tiny and leave so much space under the rear suspension. That's why I understand. When they launched the car they said that this was only possible due to the small size of the Honda PU. I think too much is being read into McLaren Honda's first 2 days. PU and electrical issues at the first test don't mean a total dud (see Red Bull last year). What remains to be seen however is if they have managed to turn around the horrible run of poor chassis they've produced over the last few years. @paul: Yes. He said last year sometime that McLaren gave him the best long term chance of winning a championship, which was a bit of a kick in the teeth to Ferrari. Alonso is a great driver, is he the best on car feed back maybe not. 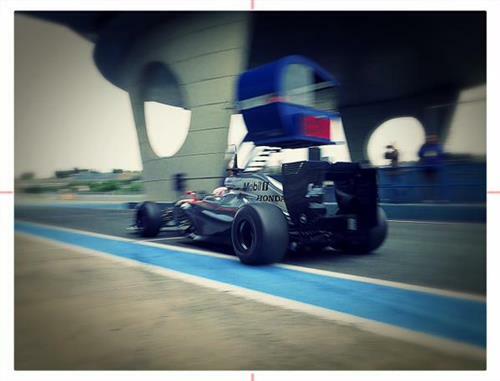 This year is Kimi's car..now lets see if he can drive it as well. @SpittingCobra: Alonso's great strength is his ability to wring it by its neck during a race weekend (especially on a Sunday) and make it behave exactly how he wants it to. There were some rumblings when he left Ferrari that he wasn't perfect when it came to testing feedback, something Vettel is known to be good at relaying to a team. Hamilton and Maldonado are the men out on track. The Lotus is chipping away at his headline time but it is still three seconds off fellow Mercedes customer Williams. Alonso has yet to show he is a teammate to anyone. He's a Prima Donna who needs the team to bow to his wishes. It'll be very rough for poor JB to deal with a rookie engine supplier AND a dysfunctional team dynamic. About the Alonso's question... it's the right moment for both he and the team. he needed a change once all the important people in Ferrari left the team last year (all who bring him to the team). And also for the team, who needed too new people in every area to start fresh. I dunno if you'll share my point of view Nate, but I think that after all this movements at Ferrari, they'll struggle to be on top... McLaren will have a slow start with their new PU, but the car looks incredible and hopefully they'll be in a better position than last year. @ralva8: With so much upheaval at Ferrari it's natural it will take them a while to re-adjust. It's significant that this is the first car fully designed by James Allison, and part of me is surprised Alonso didn't wait around at least one year to see what he could produce. But then on the flip side of that, he couldn't risk another year with an uncompetitive car. I agree with you about McLaren, once they iron out these teething issues the really interesting bit begins. I have been watching F1 for the last 30 years...by all measures Alonso is very a competitive driver and deserve to win again. Likewise McLaren as a constructor. @F7: Who was your favourite of all time? I agree, Nate. Vettel gives great feedback which gives the engineers the insight they need to improve. Alonso just chastises and insults his team when they don't hand him a competitive car. @RobCarroll: I think he's good at feedback but not as thorough as Vettel. Kimi can also benefit from Seb's feedback, I think, that's why they say that together as a team they can push the team forward. Will Toro Rosso's decision to hire rookies Max Verstappen, 17, and Carlos Sainz Jr, 20, with a combined age of 37, pay off? @KieranPalmer: Well, unlike certain other teams on the grid, Toro Rosso (with Red Bull) promote for talent not money. That is something you always must remember. Both are inexperienced but we've seen with the likes of Kvyat, Ricciardo and even Vettel when he started in F1, the really talented drivers often adapt quickly to the demands of the sport. It's an exciting season for them - patience will be key but they have two future stars on their books. Williams are starting to put together some more sustained running with Valtteri Bottas again. The Lotus E23 has just completed it's 13th lap, meaning it has now done more than the 2015 McLaren has in two days. Rob Carroll, are you for real? Have you actually heard Alonso Chastise and insult his team for giving him an ordinary car? Hello!, earth to Rob, he has been driving an ordinary car for over 5 years without complains (an old washed up horse if you will). When you talk of insult kindly listen to Lewis and Seb complain like spoilt brats when things are not going their way! I think all the drivers complain when things don't go their way, it's the nature of being a world class athlete and thinking you're the best in the world. This sounds familiar. Hamilton has just completed his 70th lap for Mercedes. His long run pace is still in the 1:27s mark. Mercedes really putting a marker down in these first couple of days. @MichelePalmer: ESPN seems to think so! @WilliamT. : Vettel is still in the garage. Worth noting there's no official lunch break during testing, so teams tend to take a break at different times. "Each year when the car shook down, he said everything was perfect, then after a few months he began complaining. A real champion is the one who is able to manage the team."